Prompted by the New York Times' story on Disney's attempt to revive the Muppet franchise (you can read that story here), this is part two in the series of interviews I did with various Muppets over the years. Today, it's a furry blue guy very near and dear to my heart, Grover. 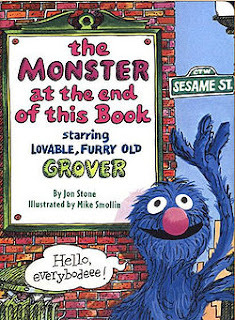 Grover is the star and narrator of the first book I can remember owning as a child, The a Monster at the End of This Book. First published in 1971, the book chronicles Grover's comical attempt to keep the reader from reaching the end of the book and thus, the monster that is waiting there. It taught me one of those great life lessons; have the courage to face your fears, because those fears are either not really real or not as bad as you initially think they might be. Yes, there have been new monsters who have moved onto television's"Sesame Street" and tickled our fancy. 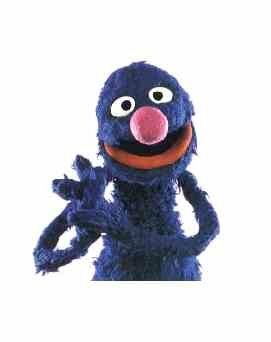 Still, Grover is one of the originals who still has a place in many people's hearts. It's hard not to love the cuddly blue guy. No other monster on Sesame Street works as hard or at as many jobs as Grover. The people in his neighborhood honor him with the DVD/video release "A Celebration of Me, Grover" -- released in August 2004. Q. You've lived on Sesame Street for a while now. When new monsters like Zoe and Elmo moved in, did they ask you for advice? Grover. There's kind of hierarchy on Sesame Street. Elmo and Zoe look up to me because I am a little bit taller. I look up to Big Bird. Big Bird doesn't look up to anybody. He's pretty big. I've shown Elmo the ropes. I've taken him with me to work on "Bring your little monster friend to work" day. He has accompanied me when I have delivered telegrams and even gone with me on my missions as a superhero. Q. So, Elmo's kind of like your superhero sidekick? G. You could say that. I really work better alone, though. Still, every now and then it's good to have help. I try to help as many people as I can. I need all the help I can get. Q. Do you remember your first job? G. I've had so many, you know. 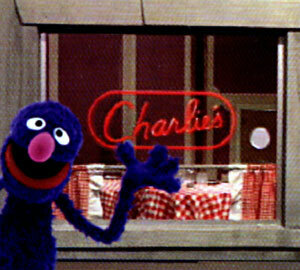 I think my first job would have been as a waiter at Charlie's Restaurant. This is the only job that I haven't been fired from. Waiting tables doesn't put food on table, though. So, I moonlight a lot. Q. What do you like best about working in a restaurant? G. The customers. More specifically, really one customer. He's loyal, a good tipper and cute with chubby cheeks. I do not know his name. He was there my first day at Charlie's and he keeps coming back. I do not let anybody else wait on him now. I make sure he always gets the service he deserves. Q. How many jobs have you had? you do not get paid for that, though. Q. Of all those jobs, what has been your favorite? G. My stint as a stenographer. Yes. You would not believe how exciting a stenographer's life is. Oh, yeah. You learn so many things, too. Do you know you have to know how to read and write? Pictures do not cut it. I tried to get away with it for about a month. Q. You've had a messy, furry "bed head" hairstyle for a while. A lot of rock stars and Hollywood celebrities are now wearing it. Are you surprised to be a trend-setter? G. Not at all. It was just a matter of time. I predict people will start dying their hair blue in the near future. Oh, yeah. You will be seeing it soon. Q. You've met a lot of celebrities. Do you have a favorite?